Thoreau lamented a modern world of endless clearing, "familiar and worn by us, appropriated and fenced in some way, and reclaimed from Nature." Things haven't improved much in the century-and-a-half since his call for simplicity. We mow our lawns and manicure our gardens until every rose juts out just so. It's a wonderful thing to behold, but it may as well be made of plastic. For true wonder, short of living alone in the woods, there are ways to give a little bit back to nature, if only at the margins. Bringing bats, birds, and butterflies to your balcony or backyard requires surprisingly little effort. Here are five ways to practice backyard conservation. There's not much work involved in hanging a bat house: ideally, mount it 10 feet from the ground facing south-southeast. (It should receive seven hours of direct sunlight per day.) If it is near a freshwater source, even better. Bats are good at finding new areas to roost. It takes somewhere between one and five years for them to move in, so don't be in a rush. Hang the box and just let it be. 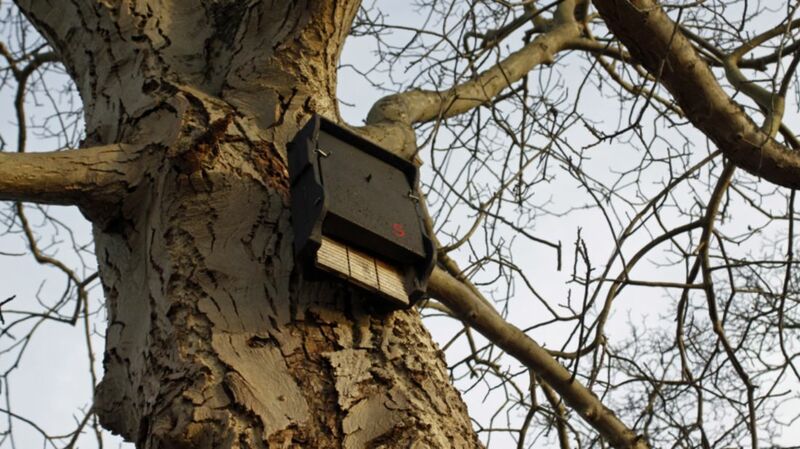 According to Bat Conservation International, 60 percent of bat houses are occupied, which means that even if you do it wrong, bats can still figure out what to do. This one is for the truly devoted. Snakes are great for your garden. Snakes are poikilotherms, which means their internal temperatures are environment-dependent. If you see one just kind of lying around, it's not waiting patiently to kill you when you least expect it. Rather, it's probably just trying to get some sun; it's how they stay alive. They are great for your garden because they move noiselessly, don't damage your plants, and can pretty much obliterate rodent families in a couple of weeks. (Grasshopper populations are similarly placed on notice.) You can build a snake habitat with logs, sticks, and vines. The idea is to build a structure with lots of holes, nooks, and crannies. If you're really devoted to the cause you can even build a full fledged snake hibernaculum. A window bird feeder might be your best bet for attracting wildlife if you live in a city. Both nectar and seed-based feeders will do the trick, and don't worry: there are more birds to be found in cities than pigeons. (A feeder in New York City, for example, can attract everything from sparrows to bluebirds.) To increase your odds of bringing in the birds, plant colorful flowers in a box alongside your feeder, and use a universal feed such as black-oil sunflower seeds. If you have a balcony, even better: add a bird bath to really make an avian's day. Those with backyards can go far beyond the goal of simply attracting birds to your garden. By choosing various types of foliage, feeders, and birdhouses, you can attract specific breeds of bird. Consider the flowers you can plant: To bring in hummingbirds, plant red and yellow tubular flowers (or just buy a hummingbird feeder). Because daisies produce nutritious seeds, a daisy garden can attract sparrows, finches, and cardinals. Sunflowers are good for chickadees, goldfinches, and blue jays. Meanwhile, different bird feeders and bird houses are designed to attract different types of birds. (An eagle can't nest in a birdhouse with one-inch holes.) Tray feeders near the ground can bring ground-feeding birds. Small perches on tube feeders can attract, say, grosbeaks while deterring grackles. There's a lot of flexibility here, and the result is a birdwatcher's dream. Fresh water is also a must to keep the birds happy and healthy, and consequently, to keep them coming back. For best results, consider a birdbath with moving water, and don't forget to clean it regularly. A clean birdbath minimizes disease risks for the bird, reduces algae, and eliminates mosquitoes. Nectar-producing plants are like butterfly magnets, and just as in the case of birds, different types of flowers attract different types of butterflies. Azaleas, coneflowers, and lantana are butterfly-friendly nectar plants. Add a few other types of plants and you can support the entire butterfly lifecycle. Caterpillars can find nourishment in hollyhocks, dill, milkweeds, and aspen trees, among many other plants. Butterflies lay their eggs on or under the leaves of such plants. When a caterpillar emerges, its eats the plant before going off and forming a chrysalis. Butterflies emerge, and the process repeats itself. It's beautiful, good for the insects, and good for you. As Thoreau wrote, "There can be no very black melancholy to him who lives in the midst of Nature and has his senses still."